I arrived at Duffy’s around 8:30pm on a Thursday evening. It is divided into separate areas that are not completely visible to each other so I wasn’t able to get a real sense of the size of the place from my table. One thing that was clear, however, was that it was very nearly deserted and the quiet emptiness of the surroundings, though nicely and comfortably furnished, gave it a rather cold austerity. 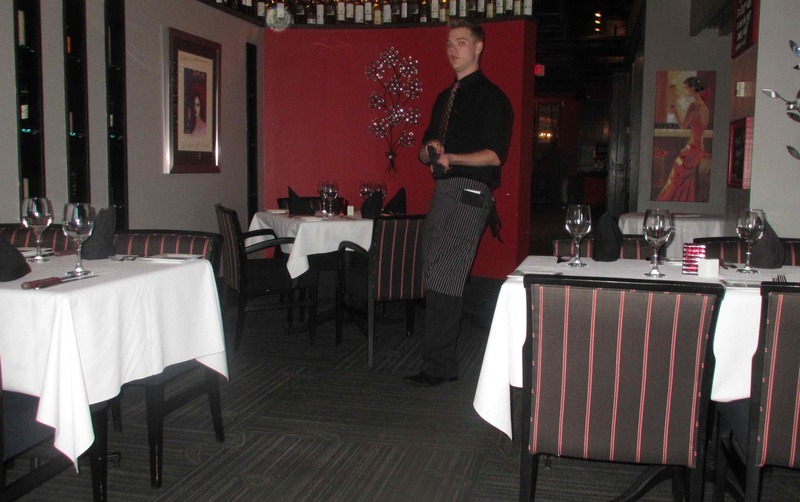 The old premises, on Spring Garden Road, were as I recall, quite small, cramped even, but there was a sort of cozy cheerfulness to the place that that the new location seems very much to be lacking. I saw only one waiter during my visit. His service was certainly competent and efficient but, though he was always polite and proper, his manner was more of a distant propriety rather than a distinct friendliness. I am not sure why a place of this sort would be so empty on a Thursday evening (especially when nearby restaurants and bars were hopping) but I must the funereal atmosphere and service did nothing to encourage visitors. 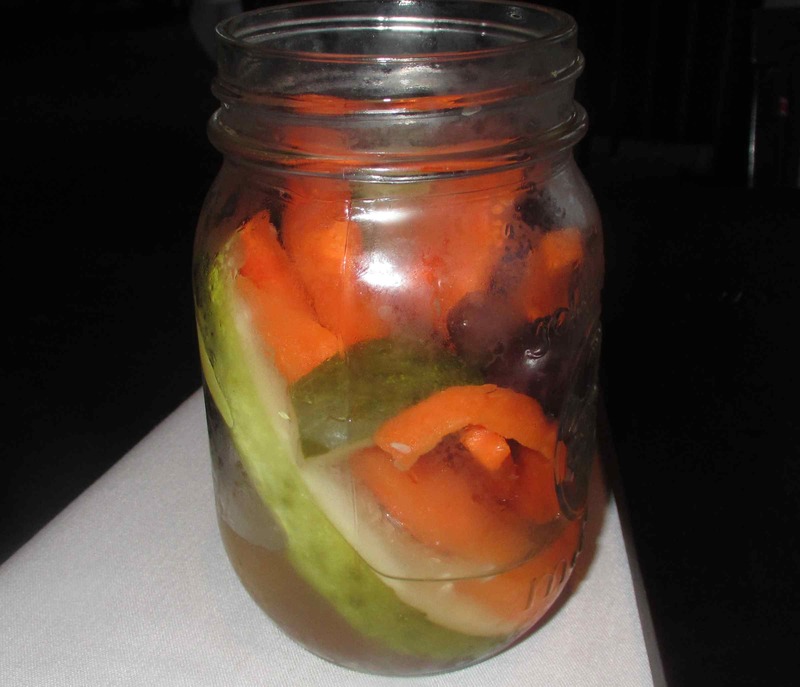 While I was perusing the menu, my waiter brought me a pickling jar full of a sort of ‘Giardiniera’ style pickles. They were quite acidic and aromatic with dill but, while they were not my favorite sort of pickle, I thought that the novel service and presentation was a nice touch. I chose Rib-eye steak for my main-course, along with something called ‘Bacon Jam’ that I ordered for no other reason that I had never heard of it before. The steak was, I must say, very deftly prepared, but the presentation of the meal as a whole left a great deal to be desired. Frankly, it was very sloppily plated and not attractive at all. 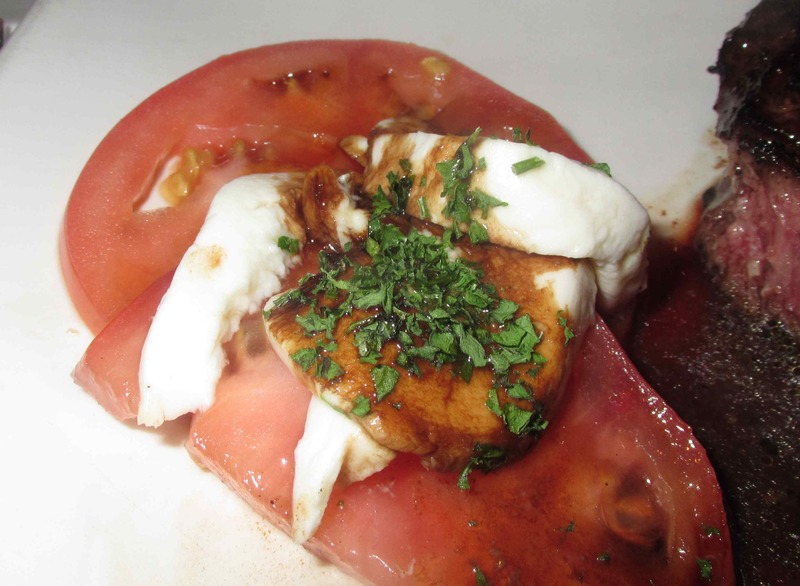 A Bocconcini salad came with the meal. It was fresh and generally pleasant tasting (with a splash of a balsamic) but, like the meal as a whole, not at all well presented. 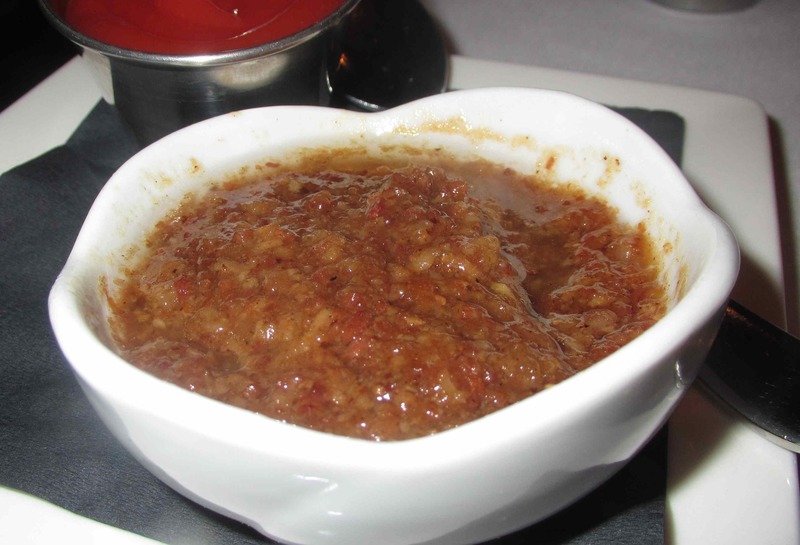 This is the Bacon Jam. I really wasn’t sure quite what to make of it and my waiter told me that especially favors it as a condiment on baked potato. 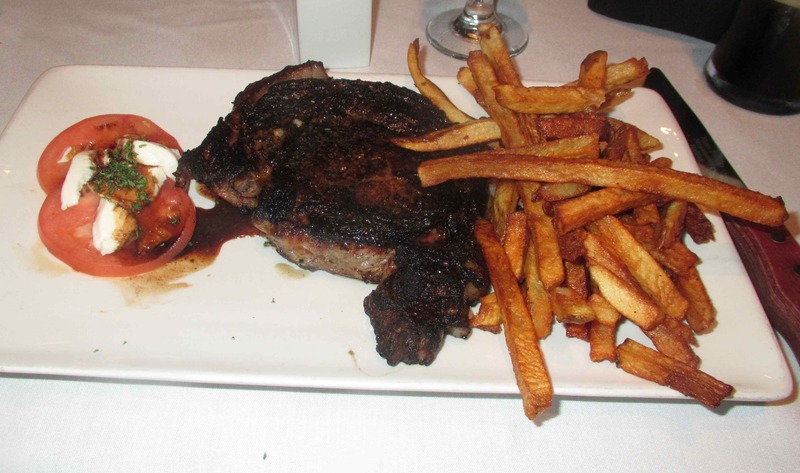 It was actually quite nice on the fries, having a rich, smoky meatiness to it, but it was far too strong an accompaniment for a very good quality steak. I’m not sure I liked it for this sort of a meal but I am still glad I got to try it anyway. 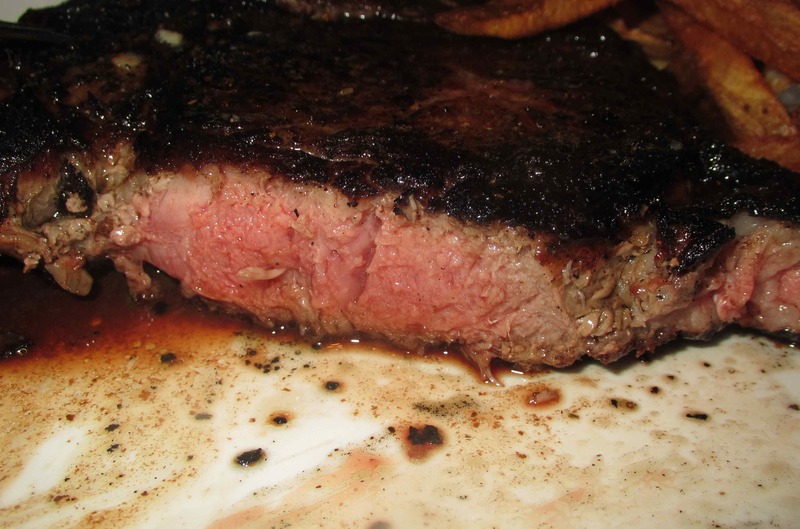 Finally, here is a close-up of my steak. It is rather funny that the menu made reference to ‘Pittsburgh Rare’ (meaning steak that is blue rare in the center and charred on the outside) but not ‘Chicago Rare’, which is my preference. I asked the waiter about having my steak cooked this way (medium rare and charred) and he had to go in to the kitchen for high-level enquiries before coming out and saying that the kitchen staff thought they could accommodate me but made no promises. This struck mas severely odd in a steakhouse (the method is not that unusual), but, as it turned out, the finished cut was done to absolute perfection. As you can see, this is a very tender and juicy piece of meat and the charring is very nicely done. I enjoyed the steak immensely and, while I won’t say it matched the flawless Wagyu steak I enjoyed a few days earlier, it came very close indeed. It is unfortunate that such a well-prepared and high quality steak was the centerpiece in a dining experience that was otherwise mediocre at very best. 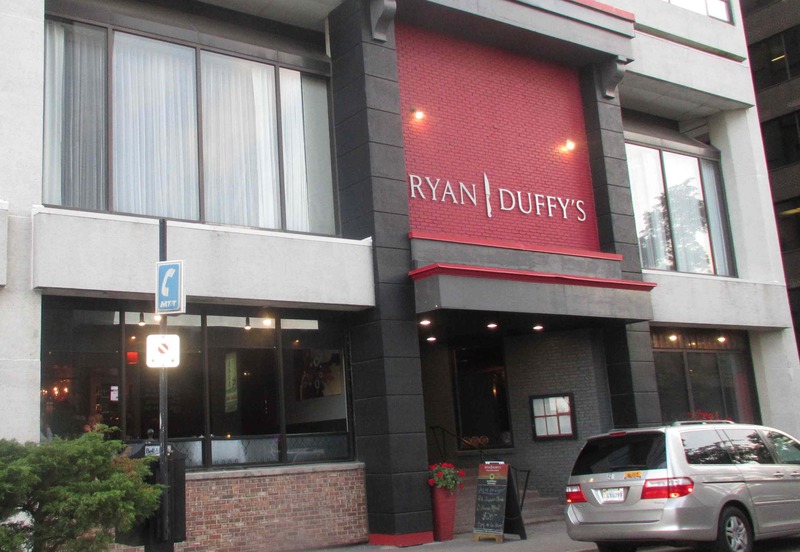 Duffy’s has the appearance of being capable of much more (and it is possible I just caught them on a bad night) but, aside from an excellent Rib-eye, I was very unimpressed. Rating: 3 out of 5.